Albert Henry Rodgers was a career soldier who served with the Dragoon Guards before transferring to the Royal Field Artillery. He was recuperating from a gunshot wound but died from influenza in the 1918 pandemic. Albert Henry Rodgers was born on 1 September 1889 at 67 Eldon Street, Sheffield, the fifth of seven children born to Alfred Hartley Rodgers (1851–1907) and his wife Emily née Moorhouse (1854–1894). Albert was baptised in Sheffield on 10 September 1889. Alfred and Emily were both natives of Sheffield where they were married in August 1873. Their first child, Alfred, was born in the following year, followed by a daughter, Nellie, six years later. There was a further gap of four years before the birth of their third child, Lilian, born in 1884. Four more children, including Albert, arrived over the next ten years, with the last being born in May 1894. Sadly, Emily died, aged 39, a week after the birth of her daughter, who was named after her; the cause of death was recorded as “puerperal septicaemia” following childbirth. Alfred re-married in April 1896 to a widow with three teenage children, Hannah Catherine Bell née Baggaley (1854–1939), but died himself on 2 March 1907. At the 1891 census, the family were living at 67 Eldon Street, Sheffield, close to the city centre, with Alfred in business as a razor-strop manufacturer, with the eldest son, also Alfred, working in his father’s business. Ten years later, the family had moved about half a mile to the west, and were living at 33 Gloucester Street, where Alfred senior was still in the same business and was now employing most of his family. On 15 July 1908, Albert enlisted as a private in the 3rd (Prince of Wales’s) Dragoon Guards, with service number D/2225. He spent the first two years of his military career in training at Aldershot, during which he earned his First Class certificate of education. The regiment moved to a base at Hounslow in 1910, where Albert qualified as a signaller, second class, and earned his assistant schoolmaster’s certificate. 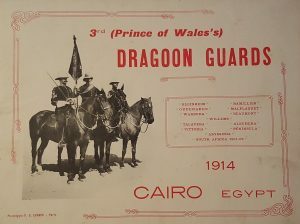 In September 1912, the regiment were sent to Egypt where they were quartered on the outskirts of Cairo to guard the Suez Canal. On 4 December 1917, like many service men stationed at Forest Row during the war, Albert Rodgers was initiated into Sackville Lodge No 1619, meeting at the Masonic Temple at East Grinstead. He was passed to the second degree on 5 March 1918 and raised to the degree of Master Mason on 7 May. Passed and raised alongside him was a fellow member of the Royal Field Artillery, Gunner Montague Walter Holliday (1882–1951), who had been employed as a clerk for a flour importer before the war. 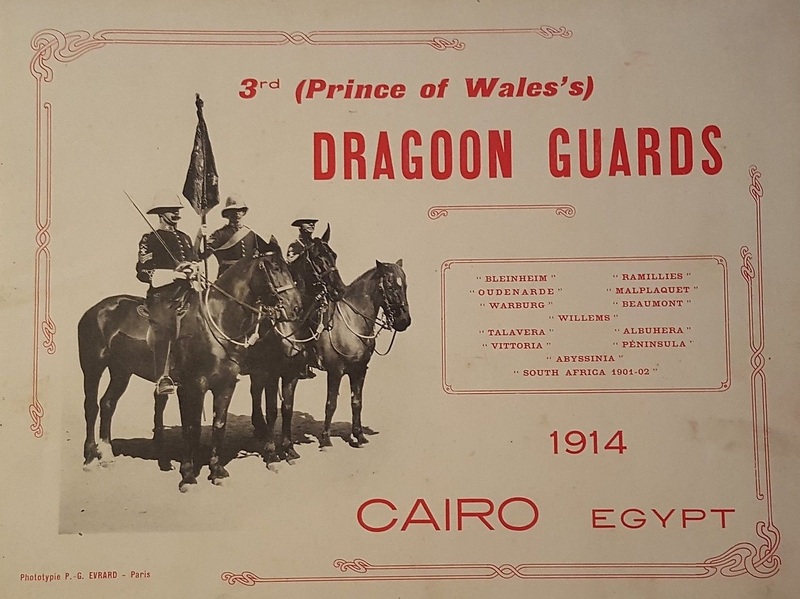 When war was declared, the 3rd Dragoon Guards remained in Cairo until September 1914, when they were recalled to England. They sailed from Alexandria on 19 September, arriving at Liverpool on 18 October, from where they travelled to their temporary camp at Ludgershall on Salisbury Plain. By this time, Albert had gained the rank of corporal. On 30 October, the 3rd Dragoon Guards travelled via Southampton on board the RMS Victorian, reaching Le Havre late the following day. From Le Havre, they travelled all day by train to Cassel, south of Dunkirk, and then marched 30km via Poperinge to Ypres in Flanders, where (still a cavalry regiment) they were attached to the 6th Cavalry Brigade in the 3rd Cavalry Division. On 5 November, the Guards (dismounted) entered the trenches at Heronthage Wood, south of the Menin Road, where they immediately came under heavy fire, suffering heavy casualties with 20 men killed and 37 wounded in two days of intensive fighting. The Guards remained in the front line, either in the trenches or in reserve for several days, holding the line as wave after wave of German troops attempted to break through to Ypres, until they were finally relieved on 18 November, to spend the winter of 1914–15 in billets behind the lines. In total, two weeks of fighting in the First Battle of Ypres resulted in 52 deaths in the 3rd Dragoon Guards. The regiment returned to the trenches at Zillebeke in February 1915 for four days. On 5 April 1915, Corporal Albert Rodgers was mentioned in despatches “for gallant & distinguished conduct in the field”. At the Second Battle of Ypres in April 1915, the guards were initially kept in reserve until early May, when they returned to the line until 20 May. Within three days, however, they were back in the line defending the Hooge chateau near Ypres. For ten days, the regiment was subjected to fearsome bombardment combined with repeated attacks from the German infantry, suffering a similar loss of life as at the First Battle of Ypres. The regiment remained in billets in Flanders until August, when they were moved south where they took part in the Battle of Loos, before spending the winter of 1915–16 in billets. In 1916, Albert (by now promoted to sergeant) was transferred to the Royal Field Artillery, and on 23 November 1916, he was commissioned as a Second Lieutenant. Having spent the winter of 1916–17 in England being re-trained as an officer, Albert returned to France on 30 March 1917, to join the 30th Battery of the RFA. In early July 1917, the 30th Battery (part of the 39th Artillery Brigade, 1st Division) were at Nieuport on the Belgian coast as part of the artillery build up for a planned invasion known as “Operation Hush”, intended to push the German forces back from the coast. On 2 July, Albert was shot by a sniper, receiving a gunshot wound to his right buttock. He was taken initially to a Casualty Clearing Station before a transfer to the 58th (Scottish General) Hospital at St. Omer the following day. On 2 August, he was sent back to England on board Hospital Ship St. Denis, travelling from Boulogne to Dover. After a short period in hospital in England, he returned to the RFA (with No 4 Reserve Brigade) and was stationed at Forest Row, near East Grinstead. In October, he appeared before a medical board who recommended that he should undertake light duties only. The following January, he was deemed fit enough to attend a three month course of instruction at the Signalling School based at Putney House. He appeared before another medical board on 3 March 1918, which reported that the wound was fully healed, but because of the nature and location of the scar he was not fit for general duties and should remain on light duties at Forest Row. In late 1918, Albert was taken ill with flu symptoms and was sent to the 15th Canadian General Red Cross Hospital at Taplow, Buckinghamshire where he died at midday on 7 November 1918. The cause of death was recorded as “influenza and pneumonia”. He was originally buried in Sheffield General Cemetery in plot Chapel O124. Subsequently, Sheffield City Council deemed his and several other war graves in the cemetery as “un-maintainable” and he was commemorated on a screen wall at the City Road Cemetery, which was moved to the Sheffield General Cemetery in 2015. As well as the British War medal and the Victory medal, 2nd Lieutenant Albert Rodgers was awarded the 1914 Star. This was awarded to members of the British Expeditionary Force who saw active service on the Western Front between 5 August and 22 November 1914, otherwise known as the “Old Comtemptibles”. WO 339/78053 Lieutenant Albert Henry RODGERS Royal Field Artillery.